Adam’s book is 22 chapters, including a Preface and Introduction. In his Preface / Introduction he mentions John Broadus’ work, On the Preparation and Delivery of Sermons. Broadus’ purpose for writing was that in his day he thought, “The great mass of young ministers, particularly in some denominations, never study homiletics under a teacher.” So Broadus gives a full-orbed course on homiletics. Adam’s believes that as much as Broadus was a helpful work in “his day”, that the purpose of Adam’s work is to, “make an impact in our day significant enough to change preaching substantially.” How? “This book is not a mere restatement of past ideas and practices in contemporary language. It takes a new turn.” I intentionally ask, “Why? Why does a new book on homiletics need to take a new turn? I don’t see the purpose here. Instead, why not encourage good preaching without thinking one needs to reinvent the wheel? Adams say on page xi, that part of the answer to why seminaries don’t do a good job in preparing men to preach is, “in the inadequate structure of seminaries themselves,” and, “part in the failure of the church leadership to take the matter of ministerial selection and ordination more seriously, and part in the almost unbelievable willingness of congregations to put up with mediocrity or worse.” I would add that it also includes a lack of knowing good preaching throughout the history of the Christian church. Adams does not really deal with historical preaching except to bewail it, which personally, to me, is bad judgment on his part. Adam’s says that the current preacher today in, “his training and resources have proved woefully inadequate for the task.” Having been preaching myself for 28 years, and listening to thousands of sermons in that time, I concur. Adams had a pastor say to him, “One pastor at such a conference (every time he passed me in the hall) said, “Please write that book on preaching!”” This alone tells you that seminaries are inadequately sending men into the pulpit without preparation. The “current minister” of a local congregation is asking Adams to write a book on preaching when there are literally myriads of works in print, and now online, to read from exceptional men in the pulpit, with successful ministries. Why didn’t the preacher know this? Chapter 2: What is Preaching? Why should a pastor preach? Good question. Pastors are exhorted to preach and teach their people as a direct command of God as heralds of His word and will. Adams says that it entails “edificational preaching,” which means the minister builds up the church through preaching so that the congregation can withstand the fire of testing. He says, “The purpose of preaching, then, is to effect changes among the members of God’s church that build them up individually and that build up the body as a whole.” To me, this is oversimplified. Preaching is first a responsibility God-ward and then secondly towards the people. 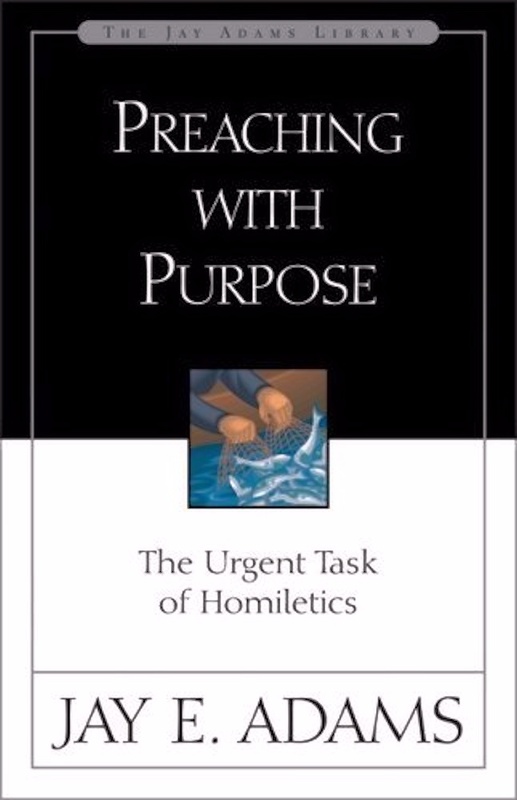 After this, Adams says, “Their sermons certainly must focus on individual change, but not for the sake of the individual alone; how that change honors God by blessing the whole is equally important.” He summarizes this chapter by saying that when the pastor observes the truth of the Word responsibly, that is the goal or purpose of pastoral preaching, because it works that truth into the life of the congregation. Adams says that biblical preaching is teaching which, “consisted of exposition of the portion read, and exhortation growing out of it.” I highlight what I find is most important in this chapter which is Adams’ exhortation that those who stand behind the pulpit today have no authority for preaching their own notions and opinions. They are exhorted to, ““preach the Word,” the apostolic Word recorded in the Scriptures.” In my opinion, three problems have arisen today that show themselves heartily: 1) preachers constantly depart from the purpose and the intent of a biblical text. Adams says that when they do this, “they lose their authority to preach.” Yes. They are no longer speaking on behalf of God, and at that point, it would be the responsibility of the discerning congregation to ignore them at that point. 2) They have trouble understanding the text, so they have trouble explaining it to the congregation. 3) If they understand the text, they have a problem ordering it to make it clear to the people. Adams teaches in this chapter that both discerning the needs of the congregation, and the choice of a biblical text are both important and should complement each other. Biblical selections ought to be made, “on the basis of the congregation’s needs.” When choosing a text, the entire Bible, and any portion used, should be made in light of the “telos”, or goal, objective and end of the proposed biblical intention. Not only should a text be chosen as a result of the overall telos of the portion of scripture, but it should also be noted in light of the entire book as a whole, and as I would add, the testament its in, as well as in relation to the administration of the Covenant of Grace (or Works depending on the context). Adams also points out that sermons should be about one main point. However, that may not necessarily prove true, when various doctrines are taken or pulled from a specific text. It would be the pastor’s choice to include one or two doctrines that a text may teach. Those in turn would complement the overall point to his text and preaching. Adams here rests on the idea that preaching should never occur until the pastor understands the point of what he is about to preach. “You must never preach on a passage until you are certain you understand why the Holy Spirit included that passage in the Bible.” This seems obvious, but in our day of “sharing” from the pulpit, it is needful to highlight. The preacher must know the intention of the Holy Spirit in a passage before it is preached. This takes work, which, in my opinion, students being initially exposed in seminary to a master’s degree of any kind, will not adequately receive. In missing the need of extensive training in biblical languages, or in-depth hermeneutics, homiletics winds up becoming frustrating for the new preacher, or they simply abandon it altogether. Adams says keenly, “This matter of purpose is such an important consideration in preaching that if your wife were to awaken you on Sunday morning at 4 o’clock and ask, “What is the purpose of this morning’s message?” you ought to be able to rattle it off in one crisp sentence, roll over and go to sleep again, all without missing a single stroke in your snoring!” This would assume the preacher understands his text. Without understanding the text, and the intention of God behind it, there can be no real, thoughtful motivation given to the congregation. There are myriads of churches all over the United States. There is hardly a ripple across the nation in conversion and sanctified godliness that affects whole communities. This starts with individuals. Adams says, “We are continually concerned about the lack of change that preaching brings about.” Preachers are not simply to know what their passages means, and to be able to communicate that effectively. They are to build the message in such a way as it, “calls on the congregation for a response that is appropriate to it. It works for change.” This is the difference between a preacher and a lecturer he says. Adams continues, “But he will do so, from start to finish, with the understanding that this pertains to them.” This is where Adams loses the informed reader, knowing that most of church history and historical theology on this topic disagree with him. I personally disagree that the preacher is to apply the sermon throughout the whole sermon to the congregation. I think that misses the point of being sure the congregation understands what the passage means as originally intended. And it blurs the lines between exposition and application, something Adams seems to disdain later in the work. Adams again encourages preachers that, “Our basic content comes from the Bible and not from other sources.” This is a statement which leads into a discussion on exegesis and hermeneutics, “but that is beyond the purpose and scope” of Adams’ book. Adams likes outlines. I do as well. My outlines are formulated in a manner to write out the entire sermon, but to break it up in such a way as to show exaggerations in size, font and color (easily used with new-fangled color printers today), where men like Jonathan Edwards wrote out their whole sermon with a quill pen. Adams doesn’t like the idea of writing out whole sermons. Its too bad Jonathan Edwards wasn’t here to correct Adams on that point. I would imagine most good preachers today would listen to Jonathan Edwards in his preaching before they listened to Jay Adams. But for inexperienced preachers, outlines will do. Adams makes a non sequitur between the lecturer and the pastor on page 51. He uses a table that, in my opinion misrepresents not only the preacher’s task, but the outline of the sermon. The reason he does this is because he is bent on dissuading students from being expositors in the pulpit, and instead being a practical “here and now” preacher all the way through the sermon. In my estimation, having read over a million pages of historical reformed content, Adams blows this part of the work completely, even disparaging the Golden Age of Preaching when he says, “When preachers who use the lecture format (inherited from the medieval scholastics through the English Puritans) realize that they must apply the passage, what they usually do is to tack on an application at the end.” I agree that poor preachers who try to copy the puritans poorly will in essence “tack on” an application without thinking through it. Adams knows that preachers often do that today, and I agree. But instead of disparaging them from a solid, biblical exposition, doctrine and application, we should teach them how to do it successfully; not create a new-fangled way of preaching without including exposition. In my opinion, Adams utterly fails in this except to add to the heap of bad instruction on this point. He even resorts, almost, to name calling when he says, “Often, preachers, especially those who try to “stay close to the text” and so-called “expository” preachers will tell you that they use the structure of the passage to determine the structure of their sermon.” Adams disparages this instead of explaining why this is the actual case that ought to occur. Adams and I vehemently disagree on at this point in his book that preachers should start their sermons with some kind of pithy introduction. He says, “Orienting a congregation, as I said, involves arresting attention and creating interest.” In my opinion, no. Instead, the congregation should be taught how to revere the word of God as the first action that preacher should accomplish in preaching while reading the text aloud. The text does not need help to, “be interesting.” Sinful people need to be arrested with the conviction that the word of God is being read, and they should have an interest in it. He says that one way to open a sermon, “is with a brief story, example, or incident.” I loathe this approach. It detracts from the text. It detracts from the time that mediocre preachers take to tell stories to fill up time, and it tells me that Adams thinks the Word of God needs help to make it interesting to the congregation. No. Again, absolutely not. Adams on this is out of touch with biblical preaching. But again, remember, reader, he is looking to tell you something new. Adams rightly says, “Without a good conclusion, the (otherwise) best sermon is a dud.” That’s true, but the thoughtful preacher is “concluding” the sermon with a third section to his overall outline which would be called “the application.” And throughout the application the preacher better be exhorting the congregation toward motivation, which in turn is the conclusion of whatever doctrine he is preaching on. “Good conclusions, like good sermons, then, work toward the goal of achieving the telos of the sermon.” Adams, unlike historical preaching, thinks that a conclusion to the sermon is telling a story. “One day a small child decided to make his daddy a birthday present. Having gathered the saw…” I can barely contain my disappointment. Adams does this because, like the preachers of his age, he too has given into the false reality that we need to be entertained in some way because the word of God is not enough. These kinds of intrusions into the text, in my opinion, detract from the word, and do not help the word. Even in Puritan Preaching, yes, Puritans used short pithy illustrations, as did the reformers. For example, “Screwing the truth into the mind.” “Heresy is leprosy of the head,” etc. These kinds of statements were short, exceedingly quick, and never weighed the sermon down. Edwards, for example, used the “illustration” of sinners hanging over the precipice of hell as a spider hangs from a thread. But at no time have I ever found historical preaching to begin with things like, “In 1953 when it was snowing in a blizzard, and the snow was piled twelve feet high, my father came home and brought me outside to shovel the driveway. Now the driveway was really long, and so he showed me how to….” Blah blah blah. These kinds of conclusions and such are simply unnecessary and continue to create bad preachers who rely on illustrations instead of the text, “For the word of God is living and powerful, and sharper than any two-edged sword, piercing even to the division of soul and spirit, and of joints and marrow, and is a discerner of the thoughts and intents of the heart,” (Heb. 4:12). Whenever I hear things like this, I tend to ask myself, “Do they believe the text is powerful?” “Do they believe IT cuts to the quick?” If the preacher wants an illustration, tell them to stick to the text and use illustrations like a powerful sword. There is no need to tell tall tales. Adams says there are times when ministers preach evangelistic sermons. To the contrary, many churches seem to simply harp on that point, and all they do is preach evangelistically. Evangelistic sermons ought to contain two major theological proponents concerning Christ, he says, “His sacrificial, substitutionary, penal death, and His bodily resurrection from the dead.” Adams correctly shows that at the end of evangelistic sermons, some mention should be made for sinners to meet with the preacher after the service to receive evangelistic guidance. Evangelistic preaching should issue an urgent call for action (which does not include the unbiblical practice of the seeker sensitive altar call invented as the seat of decision by professed Pelagian Charles Finney). One of the downfalls preachers constantly have is inadequate preparation, and “inadequate preparation is what takes away the joy of preaching.” When the pastor is rushing to throw together a sermon on Saturday night, they are shucking their main responsibility to “preach the word.” They need to start preparation far sooner. I like what Adams says when he counsels preachers to, “prepare every sermon six months in advance.” For some reason, preachers don’t think that an analysis of the congregation, and a revivalist mentality towards a “fresh” outpouring of the Holy Spirit on the people to empower them for service could happen on sermons prepared months ago. Why? Is the Word of God only fresh today? Or does it not change as God does not change? Adams says to plan out your preaching year. Know what is going to be covered for the whole year, and prepare accordingly. I have no issue with this at all. In fact, our publishing house publishes books from preachers who preached 400 years ago and……wait for it……those sermons are as important to read today as they were to hear at that time. Why? The word of God never changes. If responsible exegetical work has been done, sermons will be timeless. People are sense oriented. God gave us more than just ears, in most cases. The Puritans were masters at sense appeal and working truth into the heart to elicit a response. Adams says, “The deeper purpose of sense appeal, with its arousal of emotions, lending their dimension of reality to what is said, is full—including experiential—understanding. Sense appeal, when effective, helps the members to experience the impact of truth in addition to merely thinking about it.” He gives examples of various recent preachers, though he mentions George Whitefield, about their use of evocative words. Evocative words appeal to the senses, stir emotion, and bring about other responses. He also brings up again “storytelling.” He says using evocative words in storytelling is useful. Well, if you delete the needlessness of storytelling altogether, and save it for BOOKTV on cable, then evocative words don’t have a place in that genra. Evocative words without storytelling have a place in preaching. Historical examples of excited words, evocative words, motivate the congregation. Nathaniel Vincent said, “While we show you your sin, flee from it, that you may also flee from wrath.” Francis Roberts said, “If you live and die in your sinful and wretched natural state, then you live and die a most cursed creature, and a child of wrath, even as others.” Words like flee, cursed, and such are evocative words; they illicit responsible word pictures which in turn motivate. Adams explains that, “The best stories, like most of Christ’s parables, have to do with persons in action and/or conversation.” But he’s missed the point that parables in Scripture are in fact, Scripture. If the preacher wishes to further explain the nuanced points of Christ’s parable, they are obliged to do that. But they certainly don’t need to drag down the parable by infusing into a story about a rock concert they went to when they were 18, or how much they loved Grandma Jones’ cherry pie cooking. The congregation doesn’t need to hear about the preacher. The preacher needs to show them Jesus Christ. Adams also explains the use of sounds. The preacher’s tone, his inflection, and the use of words can enhance the sermon, or detract from it. He makes the point that preachers are in contest with modern media, and people are viewers as much as they are listeners. So the way an action is given (the moving of an arm, or the pounding of the pulpit) can enhance the way the message is given. I’m completely departing Adams on this chapter, because he is being part of the contemporary preaching problem. If the preacher is going to gather up pithy quotes, or short helps to enhance language, I’m all for it. But gathering up “storytelling” material is a waste of time if you don’t want to be part of the current preaching problem in the 21st century. Instead, purchase, buy and acquire every historical preaching book you can, and read those. Read sermons by great preachers, and do that weekly (sermons pre-1800). The more you see how good preachers preached, the more that will rub off after a few years. Adams says, “Style is language usage.” The purpose of style is to provide an appropriate and effective medium for communicating content. You must thoroughly launder your style of all such “preachy” language.” What does Adams mean? For me, it was losing the accent. I grew up in New England and had a heavy accent. But in effective communication that can be a hindrance, so I had to lose that. Also, technical language should not be part of the sermon, though it might help the preacher in his study of the sermon. Adams says, “When they preach, they sound like the latest theological treatise,” or a Greek class, or a Hebrew class, etc. The congregation will never recall those words or ideas unless the preacher makes them understandable, and if they make them understandable, then the “understanding part” is all the congregation needs to know. The preacher should never sound bookish. The preacher must diagnose this in himself, and work to correct it. “I must learn what my deficiencies are; [and] I must replace each deficiency with its proper alternative by daily work over a six-week period.” The preacher should be looking for “full fluency” in speech. They are looking to be concrete in their deliverance of truth, not verbose. They are looking to be precise. “Counseling uncovers problems in persons that preachers must know about.” In delivering sermons, Adams says that counseling plays a part in that because certain counseling after-effects will occur like “excuse making,” “a lack of discipline,” “the presence of complicating problems,” and a “failure to repent,” in the congregation as they are exposed to the word of God. Adams uses the Sermon on the Mount as a practical example of how to communicate motivation and change, and demonstrates how counseling aids in communicating those truths. The bible was “written for us.” No matter what age someone may live, the Christian can say this. However, I think Adams plays a bit in semantic games in this chapter when he says, “To speak of the preacher “applying” the truth of the Scripture to a congregation, therefore, is to miss the mark.” Really? Not at all. Adams goes on to say, “…if by that is meant you are the one who determines the application.” Ah. Ok. He continues, “The truth, when given, was already applied to the whole church by God, who Himself determined its application. It is not as though it is necessary for you to find some way to apply it. You must apply truth as God does.” It begs the question, what responsible preacher wants to apply what he wants rather than what the Word of God says? Or for that matter, Adams is simply preaching to those who bought his book and are looking for good pointers, because the preacher who is applying what he wants to apply would never buy Adams book. Preachers are notoriously poor at telling the congregation how to do something they are preaching on. What is the Bible going to produce in the congregation? What should it do? It is the preacher’s job to figure that out based on what God is communicating, and instruct the congregation in that action. Adams shows it is important in the “how to” to show “how to not” do that which would go against Scripture. The disposition of a preacher will come out in his preaching. “Like it or not, your attitude (or an attitude presumed by the congregation to be yours) toward the biblical content that you proclaim is also proclaimed—most fully by your voice and body. Your words may declare that the truth you are expounding is of great importance, but your manner may say otherwise.” This means the preacher must guard his life so that it doesn’t enter into the pulpit and overwhelm the content of the sermon. If the preacher is dissatisfied with the way his week went, that will show itself in the pulpit. If he is depressed, that will show. If he is angry, that will show, etc. Adams concludes his book with a story. Ug. It was a story about hearing a good sermon. It was, he says, “preaching.” The sermon he heard was preaching, biblical, interesting, and organized. His illustration was finally directed to the reader / preacher who needs to put together a sermon like the one he heard, so that people who hear that newly composed sermon will say, “I heard a good sermon today,” because it was biblical, interesting, and organized. from them on certain subjects. A good deal has been derived from Alexander, Shedd, Day, and Hoppin, from Coquerel and Palmer, and a great variety of other writers. See Broadus’ work in his Introduction, xii-xiii. Preaching with Purpose, p. x.
 Preaching with Purpose, p. 54. I’ll deal more adequately with this later. Preaching with Purpose, p. xiii. At RTS I had the privilege of not only taking classes at the height of theological orthodoxy among their teachers, but during work study I was able to listen to all of their taped (at the time) sermons from all their teachers in various circumstances; literally, thousands of hours of material in that setting alone. Baxter, Bridges, Murphy, Lloyd-Jones, Spenser, Broadus, Alexander, Shedd, Angle-James, Spurgeon, etc.